Seniors with Alzheimer’s disease or related dementia require a secure, structured and nurturing setting. The Memory Care Unit at the Gurwin Jewish Nursing & Rehabilitation Center is a 60-bed, secure, first floor unit staffed with specially-trained clinical, therapeutic recreation and other professional personnel who understand the unique healthcare needs and behavioral challenges that accompany cognitive impairment; the compassionate, person-centered care our staff provides enhances the quality of life of our residents, helping them to feel safe, secure and oriented in their environment. 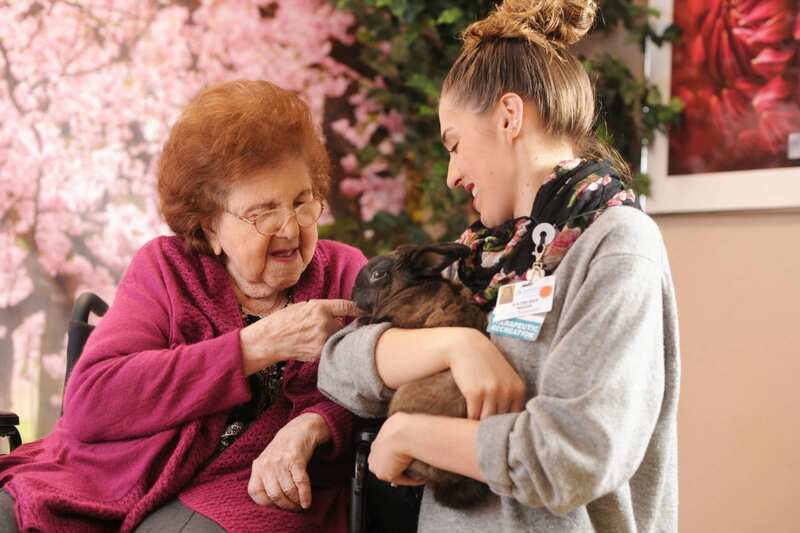 Pet therapy can help stimulate social interaction and ease agitation in residents with dementia. The Gurwin Memory Care unit boasts an enclosed outdoor garden courtyard, perfect for guided activities such as gardening, picnicking and strolling. Dedicated Recreation Leaders provide innovative programming for small group or individual activities, designed to reduce feelings of confusion, fear and agitation as well as offer enjoyable activities that stimulate the mind and body. Dietary needs are addressed appropriately, offering finger foods and access to food throughout the day, rather than expecting participation in a traditional meal setting. Making the decision to place a loved one in the care of a facility specializing in Alzheimer’s and other dementias can be emotionally difficult. We encourage you to tour Gurwin’s memory care unit and meet the staff who care for our residents with the dignity and respect they deserve. Once you visit, you’ll see that adding Gurwin to your family care team will not only benefit your loved one but also give you peace of mind. Contact us for more information about Gurwin’s memory care unit and to schedule a tour of our 5-star Long Island nursing and rehabilitation center.